When planning this road trip, I was excited to see friends, family, and the sites along the way, but I was also excited to see what the country looks like between those things. The destinations are awesome, but getting there is half the fun (my lovely wife may think otherwise)! For those readers who also wish to know what can be found in the wilds of Wisconsin and Minnesota, read on! The answer: Apparently not much can be found on I-90 in Wisconsin and even less can be found on I-90 through Minnesota. I will elaborate, lest you feel you have been given short shrift. Wisconsin is actually a very pleasant state. It has green, rolling hills and dairy farms dotting the countryside. 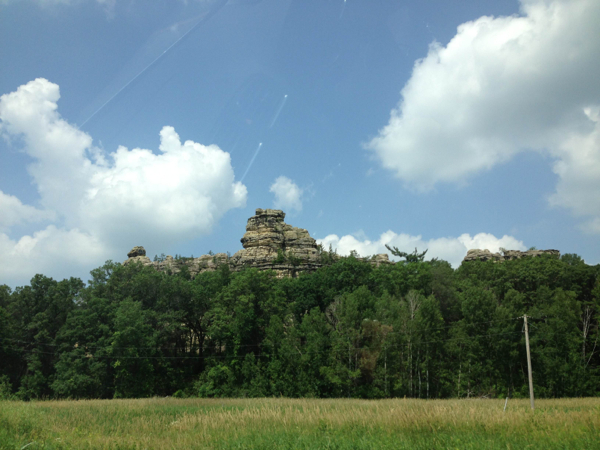 As we drove north and west of Madison, the hills became more jagged, and as you saw in Mica’s post, some interesting rock formations popped up. I should also mention the area surrounding Wisconsin Dells, which appeared to be some bizarre water park resort destination. Please comment if you know what is up with that. 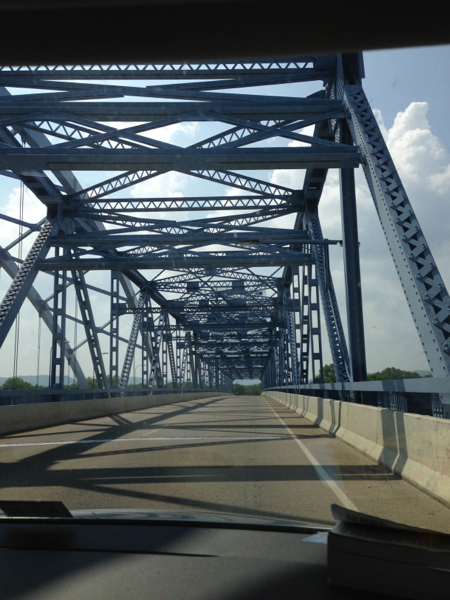 Upon crossing the Mississippi at La Crosse, Wisconsin, we were greeted by the relentless plains of southern Minnesota. There is so little in southern Minnesota that the road signs saw it fit to tell me that we were approaching the burg of Albert Lea, MN (pop: 18k) from 100 miles out. There was just nothing else in between. Plains gave way to sad little hills, which gave way to more plains. The interstate was, by and large, straight as a pin, and there were typically about 5 or 10 cars per mile of highway. I think I saw more wind turbines than on any other day of my life, even after living in Illinois for five years. I don’t mean to imply that the state of Minnesota is boring; we were just in a boring part of it (less “Land of 10,000 Lakes,” more “I Can Tell We’re Not Far From Iowa” (no offense Kim, and other Iowa natives!) (sorry for double parentheses!)). Someday we’ll see the prettier and more interesting parts, but today was not that day. Tomorrow we spend a solid day driving across South Dakota, but I am confident it will be more interesting. Faces on mountains and stuff. In Wisconsin, we saw some cool rock formations, but now that I’m looking at this picture, I have no idea where I took it. Sorry. Wisconsin residents, any ideas? 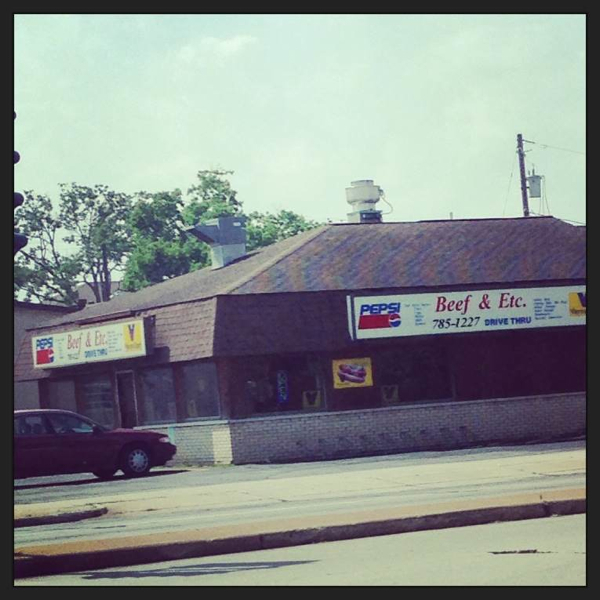 And right at the border between Wisconsin and Minnesota, I saw this restaurant. Suffice to say, we did not stop here for lunch, but I did get a giggle from the name. Today’s drive was boring; there’s no real way to get around that fact. Once we got into Minnesota, it was flat, flat land and uninteresting out-the-window sights. I have discovered that I can read in the car under these conditions, so I’ve been plowing through A Clash of Kings (kindly lent to me by Jean back in Medina!). This also gives Harrison a much-needed break from my constant changing of the satellite radio. Cassandra asked what we talk about in the car and if we run out of things to say. I usually play around on my phone, read, knit, play with the radio, or fall asleep. Sometimes, I pull out the conversation starter cards that Kim and Steven gave me for my birthday. Each one has an interesting question that makes good discussion over several miles. Though I don’t remember who we chose, we had completely different definitions of “greatest,” so our lists did not overlap at all. Congratulations, Matt and Emily! We are so excited to see you in the Bay Area. I’m really tickled that they were inspired by WVT to have a wedding that works for them. 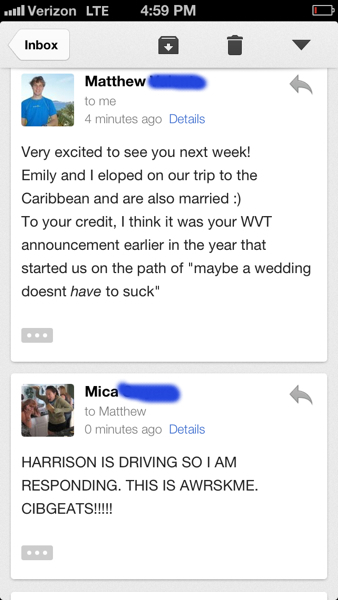 I really hope that this trip encourages other couples to plan something that makes them happy. So far, I have enjoyed WVT immensely–far more than I would have enjoyed buying a dress that I could only wear once and dealing with all the trappings of a traditional wedding. And I’m pretty sure Harrison is having a good time too. Hooray for doin’ what you want! And now, Ima’ lie on the comfy hotel bed in Sioux Falls, SD, and read some more Game of Thrones.